I had this fabric in stock for several months and decided to make myself a dress. A simple straight dress with little fuss in order to preserve this pretty print. The name of the fabric “Regent Skull” and the print itself inspired me to make a large scoop neckline (front and back) and puff sleeves “à la” Regency style. Well, that’s not how it went for the sleeves you’ll see why below. 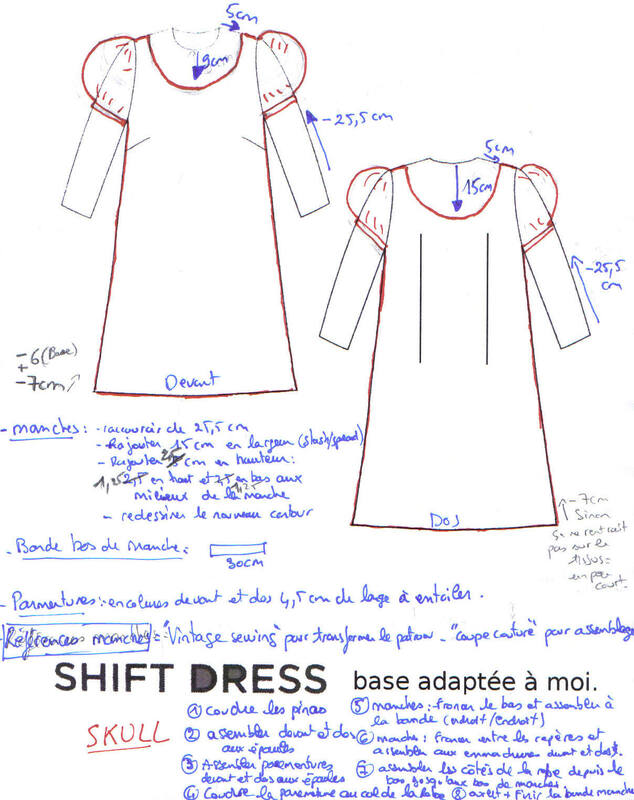 Starting point : Shift Dress pattern from the “Built By Wendy Dresses” book. Dress has 2 bust darts, 3/4 set in sleeves, regular neckline, knee length. Ending point : Mini dress with back darts, bust darts, puff sleeves with cuffs, scoop neckline (front and back) with facings, mid-thigh length. 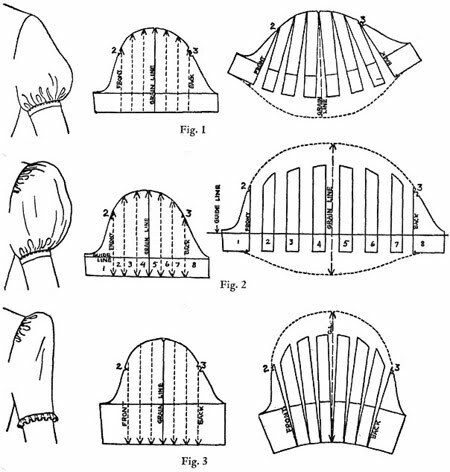 Pattern pieces : front, back, sleeve, front neckline facing, back neckline facing, cuffs. That’s not applicable here, the point being to use the pattern as a base and to transform it. Not applicable, I didn’t use a project included in the book. The basic shift dress is a great canvas to make design modifications IMO. It also looked like the easiest one and the one that would suit me the best. Plus it has a 60’s vibe to it, which I like. That was not enough : because of the one way design some of the changes I had planed and done on my muslin could not be used for the final dress (see below). * I added 2 back darts because the back looked slouchy and too sack like to my liking. * I lowered the bust darts by 3cm (a little over an inch) and lengthen them by 2.5 cm (1″). * The neckline was lifting a bit at the right shoulder seam, to rectify this, I sewed the right shoulder starting with a 1,5cm seam at the neck tapering to 0,5cm at the shoulder (right side only). * No centre back seam, the back is cut on the fold in order to have less seams and print matching to do. * I reduced the length by 13cm (5″) ! Originally I wanted to only shorten the dress by 6cm (2.5″) but because of the lack of fabric I had to shorten more to be able to fit the pattern pieces. * Scoop neckline in front and back (for the regency touch ). I Increased the neckline by 5cm (2″) at the shoulder seam and I dropped the neckline by 9cm (3.5″) in the front and 15cm (6″) in the back. Then I redrew the neckline. I have no drafting tool so I used a large salad bowl ! + I added 15cm (5″) in width (slash and spread method). Then I added 5cm (2″) in height: 2.5cm (1″) to the top and bottom of the sleeve. + I test fitted the sleeves on my muslin, and they were all beautiful and very round, I was very happy… Until I laid the pattern pieces on my “Regent Skull” fabric : not enough fabric to fit them. So I had to redesign the sleeve adding only 5cm (2″) in width and 2.5cm (1″) in height. As a result my dress does not have balloon sleeves but slightly puffy sleeves. + Created cuffs to finish the sleeves lower edges. Well the dress does not look exactly like my muslin, it was not what I originally had in mind (length of the dress, and balloon sleeves) because I hadn’t thought it through and had not taken into account the size of my fabric (I hate myself!). I also feel that I still have some fitting issues with the original pattern, I shall take the matter to the fitting woes forum soon. And I am especially pleased with the book “Built by Wendy Dresses”. It opens up tones of creative perspectives for a beginner like myself, (although the book is not that beginner friendly) it’s a first step in pattern drafting and modification. Even if you don’t use her patterns it’s inspiring. In short, this project was a little challenging for me, I had to learn many new techniques (creating facings, modifying a pattern, setting in puff sleeves …) and progress in others (print matching,…). So that’s a positive outcome for me. This entry was posted in Blog, Clothes, Sewing Projects and tagged Built by Wendy by Véro. Bookmark the permalink.